Our 22.5 inch grill grates are our most popular size and designed to fit most kettle style grills and superdomes (actual diameter 543mm, 21.4"). Our grates are made of long lasting cast iron with no seasoning required. We do suggest wiping the grates down before you use them for the first time. After grilling; simply brush away any excess food while the grill is still hot. Outdoor grilling is meant to be a fun and leisurely experience and our products reinforce that positive experience for you and your family. Nothing beats the casual atmosphere of a cook out and the all American hamburger. Family and friends get together to eat good food and relax while reminiscing and watching the kids play. The aroma of burgers slowly cooking lingers in the air and the anticipation of meal time adds to the excitement. However, all grills and grates are not created equal and just DO NOT cook foods the same way. 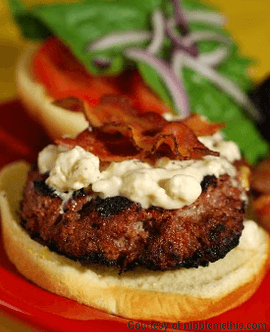 We want to let you in on a little secret to grilling the best burgers ever! The secret is in the surface and the materials the grates are made of (ie: cast iron, stainless steel, porcelain, etc.). Seasoned cast iron is the material of choice for grill grates by most professionals. Cast iron is also superior to both aluminum and steel because of it's ability to heat fast and retain the heat, yet rarely burn. 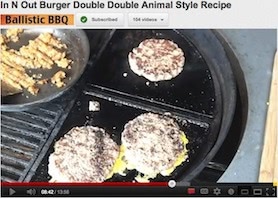 What can be worse than a burger or steak that is over done on one side and under done on the other? This happens when the heat is uneven through out the cooking surface. This is why professionals prefer a cast iron cooking surface like our 22.5" grill grates. So, there you have it. The secret to preparing the perfect burger is all in what your cooking grill is made of along with the fuel you use to heat the grill. Charcoal grills combined with our pre-seasoned cast iron 22.5 inch grill grates are a winning combination. The high heat of the flames caramelize the outside of the burger, giving it a nice charred texture. Meanwhile, the smoke from the fire bastes the burger, creating layers of flavor. It's an experience as central to outdoor cookouts as cold beer and corn on the cob. We Love To Hear From Our Customers And We Thought You Might Want To Hear From One Too! Snow is blowing and the temps are in the 20's, but I still have been getting out two-three times a week to grill. I am a very satisfied customer. I asked my wife to buy me one of the inserts for Christmas. Ron W.